The Trump administration’s decision Tuesday to issue Russia a deadline for complying with a nuclear arms treaty set in motion a tense two-month waiting period, leaving the fate of the decades-old pact uncertain at a time of growing hostility between the two nations. 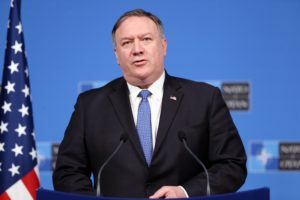 The clock officially started ticking Tuesday after Secretary of State Mike Pompeo said the United States would withdraw from the Intermediate-Range Nuclear Forces Treaty, known as the INF Treaty, if Russia does not comply with the treaty’s terms in 60 days. “Russia’s violation didn’t happen overnight. Russia’s been flight testing the SSC-8 cruise missile since the mid-2000s,” Pompeo said at a press conference announcing the deadline. Pompeo said Russia was not complying with the treaty because it has been testing the SSC-8, known by the Russia military as the 9M729, a missile that is banned under the pact. Pompeo’s ultimatum came less than two months after National Security Adviser John Bolton announced the United States’ intention to withdraw from the treaty if Russia didn’t comply with it. NATO officials issued a statement after Pompeo announced the deadline agreeing with the U.S. conclusion that Russia was in violation of the treaty. “We call on Russia to return urgently to full and verifiable compliance. It is now up to Russia to preserve the INF Treaty,” the officials said in the statement. But a Russian official quickly pushed back on Pompeo’s ultimatum. “Russia strictly abides by the provisions of the treaty. The American side knows this,” Maria Zakharova, a spokesperson for Russia’s Minister of Internal Affairs, said in a statement published in the state news agency TASS. Aleksey Pushkov, a Russian lawmaker, dismissed the deadline as a political tactic by the U.S. “In Washington, they understand that Moscow will reject such an ultimatum. And then they will announce to the whole world that Russia is to blame for everything. They need a rationale,” Pushkov wrote on Twitter. 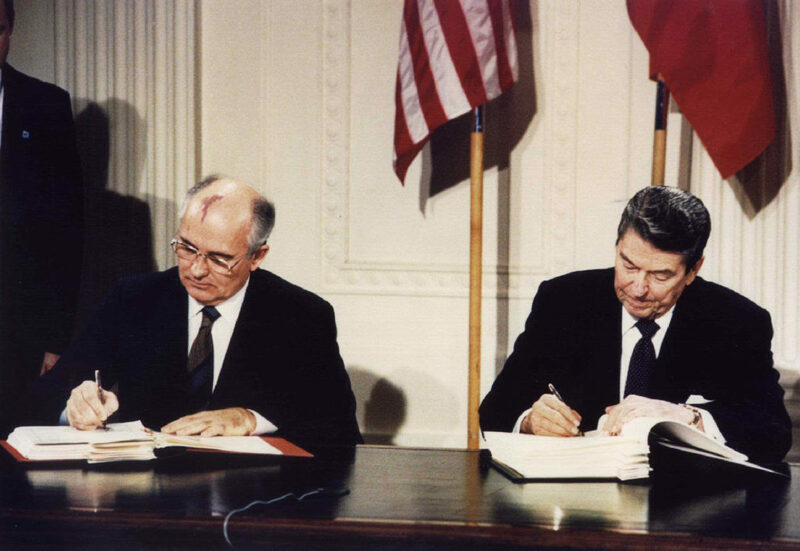 Signed in 1987, the INF required the U.S. and the then-Soviet Union to eliminate ground-launched ballistic missiles and cruise missiles with ranges of 500 to 5,500 kilometers. After the landmark deal was signed, the United States and Soviet Union destroyed about 800 and 1,800 missiles, as well as missile launchers, and other equipment. Experts argue that eliminating this arms deal could mean the beginning of an arms race in Europe, where the INF is considered an essential part of Europe’s security strategy. An EU spokesman said in a statement in October that the treaty “constitutes a pillar of European security architecture” and it contributed to the end of the Cold War. But according to a fact sheet released Tuesday by the U.S. Department of State, Russia has repeatedly violated the treaty terms while ignoring U.S. concerns. Since 2013, the United States has tried to engage on the issue more than 30 times with “all levels of the Russian government,” the State Department report said. For its part, Russia has alleged that the U.S. violated the INF treaty by deploying the Aegis Ashore missile defense system. The State Department has disputed Russia’s claim and defended its compliance with the treaty. The claims, counter claims and overall lack of dialogue on arms control between the two countries could be an obstacle in saving the treaty. The United States and Russia were scheduled to discuss arms control at G20, but President Donald Trump cancelled a planned meeting with Russian President Vladimir Putin following the Russia-Ukraine clash in the Kerch Strait. Despite the challenges, some experts said they were hopeful the treaty could be saved. NATO’s support for the 60-day deadline issued by the U.S., and its statement calling out Russia for violating the treaty, were promising signs said Frank Rose, a senior fellow at the Brookings Institution who served as an assistant secretary of state for arms control in the Obama administration. Pompeo’s latest move could also assuage European allies after the Trump administration’s initial announcement in October, Rose said. That announcement caused significant unease among America’s European allies. Bolton’s notification that the U.S. intended to withdraw from the treaty was not backed up by statements of support from NATO, and was perceived as a unilateral decision by an administration known for spurring its allies international agreements. What is the future of arms control? If Russia does not comply with the treaty in 60 days, the U.S. could invoke its legal right to withdraw from the agreement. The process of withdrawing would take six months, according to the terms of the treaty. Pompeo said Tuesday that the United States “would welcome a change of heart” from Russia. But new deadline is not likely to push Russia to acknowledge the violation, Kimball said. To comply with the treaty, “Russia will probably have to exhibit the missile to U.S. inspectors and if it is found to be capable of flying over 500 kilometers, they will have to agree to eliminate it,” Kimball said. 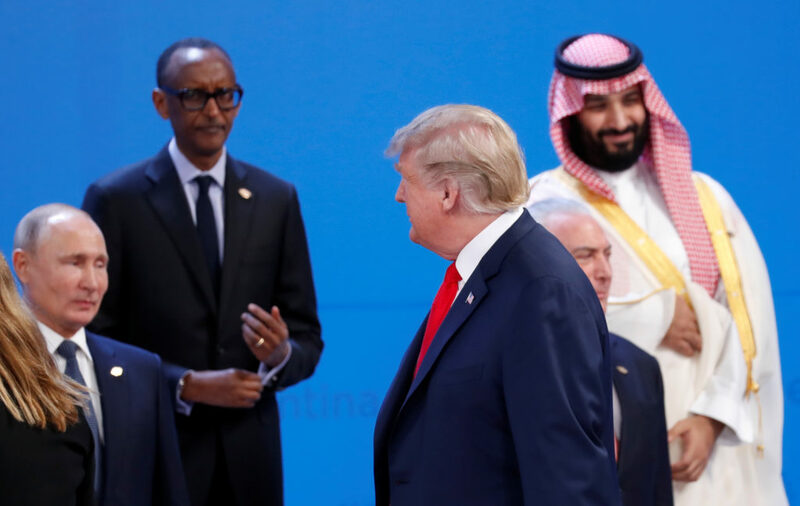 Others argued that the U.S. should be focused on confronting new military threats and rising world powers, like China, instead of focusing on saving an arms treaty that was signed more than three decades ago. “Arms control treaties are not like the ten commandments. They’re sort of useful at some points, and then they can be changed, or some can be withdrawn, based on strategic or military technological conditions,” said Elbridge Colby, the director of the defense program at the Center for a New American Security. If Russia does not comply with the treaty in 60 days, the U.S. could invoke its legal right to withdraw from the agreement. Nuclear arms experts also warned that the if the INF pact falls apart, it could put the New START treaty, a broader nuclear weapons agreement, in danger as well. Under the 2010 New START treaty, the U.S. and Russia agreed to reduce the number of their nuclear warheads and bombs by 30 percent over seven years. The agreement expires in 2021; if it’s not renewed, the U.S. and Russia’s arsenals of nuclear weapons would be unregulated for the first time since 1972. “The likely demise of INF makes the preservation of the New Strategic Arms Reduction Treaty all the more vital, because without it there will be no legally-binding limits on the world’s two largest arsenals,” Kimball said. The Trump administration has not signaled plans to renew the New Start treaty. The administration’s Nuclear Posture Review, a report released earlier this year, did not commit to extending the treaty. Bolton has also been critical of the treaty, calling it “profoundly misguided” in a Wall Street journal opinion article published a few months after New Start was signed.